Der Freischütz, Op. 77, J. 277, (usually translated as The Marksman or The Freeshooter) is a German opera with spoken dialogue in three acts by Carl Maria von Weber with a libretto by Friedrich Kind. It premiered on 18 June 1821 at the Schauspielhaus Berlin. 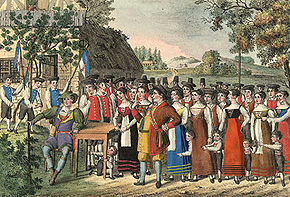 It is considered the first important German Romantic opera, especially in its national identity and stark emotionality. The plot is based on the German folk legend of the Freischütz and many of its tunes were thought to be inspired by German folk music, but this is a common misconception. Its unearthly portrayal of the supernatural in the famous Wolf's Glen scene has been described as "the most expressive rendering of the gruesome that is to be found in a musical score". The reception of Der Freischütz surpassed Weber's own hopes and it quickly became an international success, with productions in Vienna the same year followed by Leipzig, Karlsruhe, Prague, other German centres, and Copenhagen. 1824 saw productions in four London theatres in four different adaptations, as well as the French premiere at the Théâtre de l'Odéon as Robin des Bois. On 7 March 1838 soprano Jenny Lind made her operatic debut as Agathe at the Royal Swedish Opera. Among the many artists influenced by Der Freischütz was a young Richard Wagner. A version in French with recitatives was prepared by Hector Berlioz for a production at the Paris Opera in 1841. This was revived at the Paris Opéra-Comique in 2011. The overture and the "Huntsmen's Chorus" from act 3 ("With princely enjoyment and manly employment") are often performed as concert pieces. At a practice target shooting, the assistant forester Max loses to a young peasant, Kilian, who is proclaimed "King of marksmen" (Chorus: Viktoria! Der Meister soll leben—"Victory! Long live the master"). Kilian sings a good-natured song mocking him (Schaut der Herr mich an als König—"Let him gaze on me as king"). Max is in love with Agathe, daughter of the head forester Kuno, and desires to become Kuno’s successor as head forester. However, a test of skill in marksmanship is required, with the trial to be held the following day. As Max has had ill luck for several days, he easily falls under the influence of Kaspar, who persuades Max to cast seven magic bullets to be used in the contest. Kaspar, whose soul is to be sold to the devil the following day, hopes to obtain three more years of grace by substituting Max in his place (Trio of Kuno, Kaspar, and Max; chorus: O diese Sonne—"O the sun"). Left alone, Max sinks into a deep melancholy at the thought of losing Agathe by failing the shooting contest (Aria: Durch die Wälder—"Through the woods"). Kaspar, with incantations, tries to imbue him with courage (Hier im ird'schen Jammerthal—"Here in this vale of tears"). He hands Max his gun, loaded with a magic bullet—Max kills an eagle soaring at a great height, to his own astonishment. He resolves to go with Kaspar at midnight to the terrible Wolf's Glen to cast the magic bullets, which will kill anything the shooter wishes, in order to win the prize. Kaspar, left alone, triumphs (Aria: Schweig! damit dich Niemand warnt—"Silence, let no one warn him"). At the moment when Max shoots the magic bullet, a picture of Agathe's ancestor hanging on the wall falls to the floor, slightly wounding her. Agathe's cousin and companion Ännchen replaces it (Duet: Schelm, halt fest!—"Rogue, hold fast!"). Agathe is still more disturbed, but Ännchen endeavours to cheer her with jests (Ännchen: Kommt ein schlanker Bursch gegangen—"Comes a pretty boy this path"). Agathe is filled with sad forebodings, singing of meeting with a hermit in the forest, who told her that in some danger which menaced her, she would be protected by her bridal wreath. Agathe, left alone, awaits Max with the news of his success, which she interprets as a favourable omen (Recitative and aria: Wie nahte mir der Schlummer…Leise, leise—"How did slumber approach me…Low, low"). Max arrives, acknowledging that while he has not been the victor, he has killed a deer and will bring it this evening from the Wolf's Glen. Notwithstanding the prayers of Agathe and Ännchen, Max departs (Trio: Wie? Was? Entsetzen!—"How? What? Oh, horror!"). Kaspar calls upon Samiel, the Black Huntsman, for assistance in preparing the casting of the magic bullets. Max arrives and is warned by the spirit of his mother to abandon the project. Samiel conjures up the shape of Agathe, representing her as drowning herself in despair at Max's ill success, whereupon he plunges into the glen. With demoniacal noise, the casting of the bullets has begun. Agathe is praying (Aria: Und ob die Wolke sie verhülle—"Through clouds obscure"), her doubts having returned owing to a dream of ill omen. Ännchen again cheers her with laughter and song. (Romance and aria, subsequently added by Weber: Einst träumte meiner sel'gen Base—"My deceased cousin had a dream"). The bridesmaids arrive with the bridal wreath (Song: Wir winden dir den Jungfern-Kranz—"We wind round thee the bridal wreath"), but Ännchen opens the box, she finds within a funeral wreath, further increasing her misgivings. She is somewhat comforted by the memory of the hermit's promise that she will be protected by her bridal wreath. Having split the seven bullets between them, Max has used two and Kaspar has used three. Max demands that Kaspar give him his last bullet to use in the final shooting contest, but Kaspar refuses. As Max leaves, Kaspar shoots a fox, thus making Max's bullet the seventh and controlled by the Evil One. Prince Ottokar awaits Max at his tent (Chorus of foresters: Was gleicht wohl auf Erden—"What excels the pleasures of the chase"). Max is now to shoot a dove, but as he takes aim, Samiel, the black huntsman, guides the bullet and causes Max to fire at Agathe, who is apparently wounded (Finale: Schaut, o schaut—"See, oh see"). Agathe falls, but her bridal wreath has deflected the bullet, which strikes Kaspar. Agathe revives from her faint and Kaspar, seeing a holy hermit by her side, realizes that he has failed. Samiel grasps him instead of Max, whereupon Kaspar expires with a curse upon his lips. Prince Ottokar orders the corpse to be thrown into the Wolf's Glen, then demands and receives an explanation from Max. In spite of pleas from Kuno, Agathe, peasants, and huntsman, the infuriated Prince pronounces the sentence of banishment. Before this can be carried out, however, the hermit enters into their midst. The Prince acknowledges the holy man, and asks for his counsel. The hermit explains that the combined effects of love for Agathe, and fear of losing her should he fail the shooting trial are what caused Max to stray from a life that was formerly without fault. The hermit goes on to condemn the trial shot, suggests a probationary year as penalty, and asks who among the assembled has looked into their own heart and would be willing to cast the first stone. If Max lives a faultless life, he will gain forgiveness and be permitted to marry Agathe. The Prince commends the hermit for his wisdom, saying a higher power speaks through him. The Prince ends his pronouncement by saying that he himself will place the hand of Agathe in that of Max when the probation is over. The opera ends with the ensemble singing prayers of thanks. In the orchestra pit: 2 piccolos, 2 flutes, 2 oboes, 2 clarinets, 2 bassoons, 4 horns, 2 trumpets, 3 trombones, timpani, strings (violin I and II, viola, cello, double bass). Onstage: 1 clarinet, 2 horns, 1 trumpet, violins, celli. Der Freischütz afforded me great pleasure; in many places in the first act my eyes were moist with tears. In the second act Krauss pleased me greatly by her wonderful rendition of Agathe's aria. The Wolf's Glen was staged not at all as splendidly as I had expected. The third act was curious because of the French brazenness with which they took the liberty, on the one hand, of inserting Invitation à la valse with the most stupid dances, and, on the other, of cutting out the role of the hermit who appears at the end for the dénouement. Franz Liszt prepared a piano transcription of the overture in 1846 (S.575). The Black Rider is a stage musical by Robert Wilson, Tom Waits, and William S. Burroughs, based on Der Freischütz. Magic Hunter (Hungarian: Büvös vadász), a 1994 Hungarian film by Ildikó Enyedi, updates the story to the present time, with Max (Gary Kemp) as a police marksman. Philip Pullman's novel, Count Karlstein, takes a number of motifs from this opera. Little Otik, the Czech film by Jan Švankmajer, uses the overture of the opera as its main score. Karel Arnoldus Craeyvanger wrote an introduction and variations on a theme from Der Freischütz for guitar in c. 1851. A rendition of the "Huntsmen's Chorus" is used in the unlicensed NES game Magic Jewelry. The manga/anime series Hellsing uses elements of Der Freischütz in the antagonist Rip Van Winkle, with "O diese Sonne" being sung at the time of her demise. ^ Scholes, Percy A., 1952, The Concise Oxford Dictionary of Music, London: Oxford University Press, p. 219. ^ Boyden, p. 339: "The German Romantic opera really began with Der Freischütz of Carl Maria von Weber (1786–1826). See also p. 284 n. 2: "Indeed from Weber's Freischütz (1821) one can date the beginning of musical Romanticism." ^ Boyden, p. 339: "This work ... marked the emancipation of the German opera from Italian and French models ... In addition to the magic and supernatural elements, the opera specializes in local color of the forest, peasants, rustic love, hunting, and hunting horns ... the folk tale, the folk-song type of melody, and folk dances. These elements are rather naïve and nationalist in emphasis." ^ Taruskin, Richard; Gibbs, Christopher H. (2013). The Oxford History of Western Music (College ed.). Oxford University Press, Inc. p. 527. ISBN 978-0-19-509762-7. ^ Carl Maria von Weber: Der Freischütz. In: Kaminski, Piotr. Mille et Un Opéras. Fayard, 2003, pp. 1726–7. ^ Berlioz and the Romantic Imagination. Catalogue for exhibition at Victoria and Albert Museum for Berlioz centenary. Art Council, London, 1969, p. 84. ^ Le Freischütz. Opéra-Comique season book 2010–2011, pp. 37–38. ^ a b The role names, their order and voice types are from Brown 1992, p. 296, unless otherwise noted. ^ Premiere cast from Casaglia (2005), unless otherwise noted. ^ Kutsch & Riemens 2003, vol. 6, pp. 4584–4585, say that Heinrich Stümer (1789–1856) created the role of Max. This spelling of the last name agrees with the complete score published by C. F. Peters (Weber n.d. ). Casaglia 2005 lists "Karl Heinrich Stürmer". Kutsch & Riemens list a bass-baritone by the name of Heinrich Stürmer (1811–1902), but do not have any entry for a Karl Heinrich. ^ According to Brown 1992, p. 296, Ännchen is a mezzo-soprano role. However, the complete score published by C.F. Peters (Weber n.d. ) lists it as a soprano role, as do Holden 2001, p. 1053, and Kobbé 1997, p. 957. Johanna Eunicke, who sang the role in the original production, was a soprano. Weber added a romanza to the third act ("Einst traümte meiner sel'gen Base") especially for this singer, which she performed to great acclaim at the premiere (Kutsch & Riemens 2003, vol. 2, p. 1366). ^ "Wiesbaden, Hessisches Staatstheater – DER FREISCHÜTZ" [Wiesbaden, Hessian State Theater — DER FREISCHÜTZ] (in German). 1 February 2008. Retrieved 1 February 2019. Brown, Clive (1992). "Freischütz, Der ('The Freeshooter') Romantische Oper in three acts" in Sadie 1992, vol. 2, pp. 296–299. Casaglia, Gherardo (2005). "Der Freischütz, 18 June 1821". L'Almanacco di Gherardo Casaglia (in Italian). Kobbé, Gustav (1997). The New Kobbé's Opera Book, edited by The Earl of Harewood and Antony Peattie. New York: G.P. Putnam's Sons. ISBN 978-0-399-14332-8. Wikimedia Commons has media related to Der Freischütz.